Class 4. 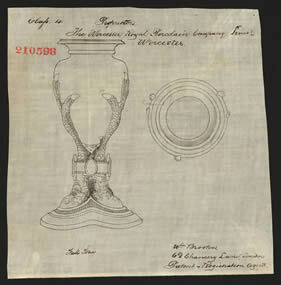 Proprietors The Worcester Royal Porcelain Company Limited, Worcester. Full size. Wm. Brookes 62 Chancery Lane, London, Patent & Registration agent. See Henry Sandon, Royal Worcester Porcelain from 1862 to the Present Day, (Clarkson N. Potter, Inc, New York, 1973, 1st American edn, 1975), page 171 which lists this design as factory shape Class 6 number 103 with the shape title 'St Aubyn Vase'.